AKA STYROFOAM, all take out containers must be compostable or recyclable. To the extent available in the community. Only reusable tableware is used for on site dining. Utensils for to-go food are provided only upon request. .
For takeout or to-go orders. Discount offered to customers with reusable cup, mug, bag etc. Energy efficiency efforts such as LED lighting and energy Star appliances. Plastic pollution is suffocating our ocean and the many animals that call it home. Researchers estimate there are now over 5.25 trillion pieces of plastic in the ocean with the number continuing to grow every day. This pollution is impacting our marine ecosystems, wildlife such as seabirds, dolphins, fish, and turtles, and plastic fragments are even displacing plankton at the base of the food chain. So what’s the best way to combat this global epidemic facing our ocean? It’s simple: we need to stop the problem at its source! 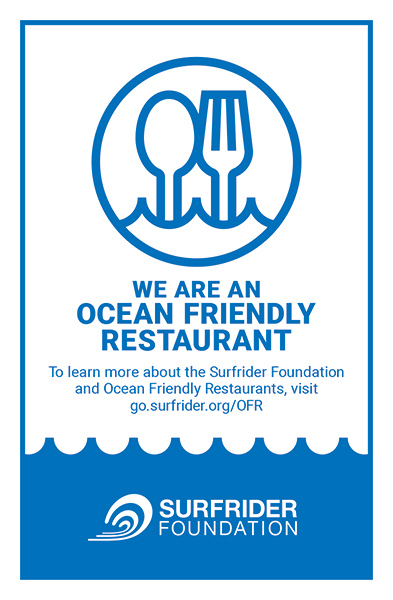 The Surfrider Foundation’s Ocean Friendly Restaurants program does just that. One restaurant, one customer at a time, increases awareness, drives change in behavior and ultimately creates scalable impact to reduce our plastic (and water!) footprint. Join over 200 restaurants around the country protecting our ocean! The Ocean Friendly Restaurants membership fee is based on a sliding scale ranging from $125 to $175 for local businesses based on the number of employees at the restaurant. As a member of the Surfrider Foundation, your Ocean Friendly Restaurant demonstrates to your customers and your community your commitment to our environement and ocean.